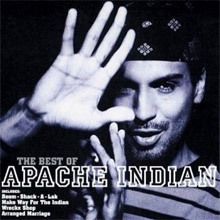 Steven Pakur, or as we know him and love him the one and only Apache Indian, enjoyed considerable success on these shores and abroad in the early 1990s. Thanks to an effervescent and charismatic live act he was able to translate his considerable DJ skills into a recording career of note. He was particularly popular in the singles market and the clubs and helped to pioneer and bring to the forefront a winning blend of Asian, street culture and reggae influenced beats. Albums like No Reservations, Make Way For the Indian and Real People/Wild East kept his currency honest and he won numerous awards. He swept the board as Best Newcomer at the British Reggae Industry Awards in 1990 and over a decade later he was an inaugural winner again at the UK Asian Music Awards,a platform where he continues to feature. We give him maximum props too for his groundbreaking Nuff Vibes EP from 1993 that spawned the global hit ‘Boom Shack-a-Lak’ and point you towards the remixed version of his hits as well as his collaborations with Tim Dog, Frankie Paul and Desmond Dekker. Apart from those discs that have the Apache Indian name in lights he has worked with an incredible spectrum of artists - Boyz 11 Men, Blackstreet, Sean Paul, Maxi Priest, General Levy, Shaggy and Boy George have all befitted by hiring his skills. In more recent years he’s delved deep into the Bhangra scene and Bollywood and broadened his horizons with leaders of that booming cultural wonder– A.R. Rahman, Asha Bosie and Jazzy B amongst many. Steven Pakur was born in the Handsworth area of Birmingham in 1967. He cut his musical teeth in the same locales as Steel Pulse and UB40, learning all about the sound system scene and growing his locks meantime. He became a well-known figure on the dancehalls in the Midlands and his own debut plate ‘Movie Over India’, thrilled everyone with its uncanny blend of bhangra and ragamuffin – hence the term bhangramuffin was coined on his behalf. Ensuing hits ‘Chok There’ and ‘Don Raja’ broke him out and he was signed to Island Records with a spectacular advance and a well-planned media campaign. All a piece of cake for the Apache Indian it seemed, as he took to his TV, radio and press promotional schedule with ease and became a well known face and a respected cultural commentator. Now working with cousins Simon & Diamond he unleashed his bhangramuffin music on the excellent No Reservations (1993). Mixing and matching his previously mentioned tracks with all-new tunes Apache Indian moved to Jamaica to record with Phil Chil and Sly Dunbar assisting Simon & Diamond. This album is notable for cuts like ‘Fe Real’ (featuring Maxi Priest), ‘Don’t Touch’ (with Frankie Paul) and the significvant hit ‘Arranged Marriage’. 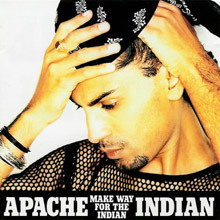 Socially and culturally astute as that song is – it was still considered to be a controversial if not taboo subject – Apache Indian didn’t pull his punches elsewhere as he tackles topics like alcoholism, drug abuse, AIDS and racism and also exhibits his sense of humour in ‘Magic Carpet’ and the self-referencing ‘Badd Indian’. His second album Make Way For The Indian (1995) was another collaboration with Sly & Robbie at the controls and chimes with emergent strains of cross-fertilised hip hop and roots reggaew all bossed by the Indian ragamuffin. Again he faces thorny subjects head on – ‘Ansa Dat’, ‘I Pray’ and ‘Right Time’ - and also encapsulates his desire to take reggae music back to his spiritual home in Asia. Combining fun and thoughtful issues is an Apache trait of course and we point you to his club smash ‘Ragamuffin Girl’ whose irresistible rhythms still sound way ahead of the curve. By now we find that Apache is notching up big sales and gathering gongs He will go on to sell 11 million albums worldwide, having 7 UK top 40 hits, 4 Brit nominations, a Mercury Music Prize nomination and 2 Ivor Novello awards in his locker. We also recommend The Best of Apache Indian, a compilation that bubbles over with inventive rapping, the slinkiest rhythms and exceptional cuts like ‘Caste System’, ‘Armagideon Time’ and the Wreckx-n-Effect mix of ‘Wreckx Shop’ plus all the hits. A bit of a guru is our Apache Indian. He has certainly been feted but we think he’s ripe for rediscovery now. Make way for the ragamuffin rapster. Steve Kapur is of East Indian descent, but he grew up in Birmingham, England, an industrial town burdened with economic hardship but blessed with a large immigrant population of various ethnicities, notable among them West Indians from Jamaica and actual Indians from India. Under the stage name Apache Indian, Kapur was one of the first artists to successfully fuse dancehall reggae with bhangra (the rock-influenced dance music favored by the Anglo-Indian youth), and he achieved significant chart success with his early singles and debut album. Make Way for the Indian was his sophomore effort and failed to achieve the same success, but it's an eminently worthwhile album nevertheless. Here he covers the Willie Williams tune "Armagideon Time" with the help of dancehall superstar Yami Bolo and "Raggamuffin Girl" with Frankie Paul. "Boba" is one of the most explicitly bhangra-based songs he has recorded, and it's one of the best things on the album, which also includes his huge hit "Boomshackalak." Song for song, it's difficult to see why this disc didn't perform as well in the marketplace as his debut. Comprehensive 17 track Best Of collection including all of Apache Indian's biggest hits such as Boom-Shack-A-Lak, Make Way For The Indian & Arranged Marriage. 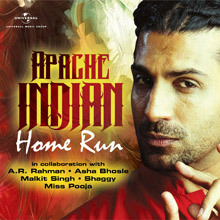 Released by Universal Music India in 2012, Home Run was Apache Indian's 7th studio album. 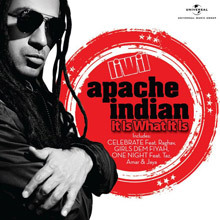 Apache Indian's most recent album, It Is What It Is, was released in 2013. 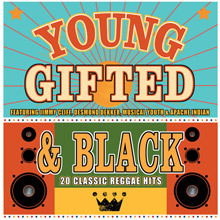 A 20 track compilation featuring legendary Reggae artists such as Apache Indian, Jimmy Cliff, & Desmond Dekker. 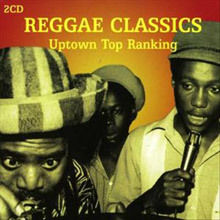 A 40 track collection featuring legendary Reggae artists such as Apache Indian, Jimmy Cliff, & Desmond Dekker.